There's a choice of 2.0-litre petrol and diesel engines, with power ranging from 150PS to 250PS. Most buyers will opt for the diesels, which return good fuel economy and are reasonably refined - albeit with a slight rumble should you attempt to make progress. The D4 is the pick of the range, thanks to its impressive real-world fuel economy (check Real MPG for the latest figures) and useful amount of torque. It's not quick, but it's got enough grunt for overtaking and lazily eating up motorway miles. Both the D3 and D4 diesel engines can be paired with a six-speed manual or eight-speed automatic gearbox. The auto suits the car's relaxed nature, but it really doesn't like to be hurried - hesitating if you request a sudden burst of acceleration. You shouldn't dismiss the manual - it's got a slick change and a light clutch pedal. If you've got an aversion to diesel or most of your miles are around town, the T5 petrol has a generous 250PS, but it doesn't feel as sprightly as its 6.7 second 0-62mph time suggests. It's expensive, too - you might be better waiting for a plug-in hybrid model to arrive late in 2019. Volvo is going for the Audi and BMW market with its V60 R-Design, which drops ride height by 12mm thanks to its sports suspension. At higher speeds, this works well, providing a dynamic drive as alluded to by its sporty looks. Around town, however, it's unneccesarily firm, finding every bump in the road and passing them into the cabin. The V60 is at its best in non-sporty guise, providing a lovely, relaxed drive: quiet, with decent (if light) steering, ride and handling. 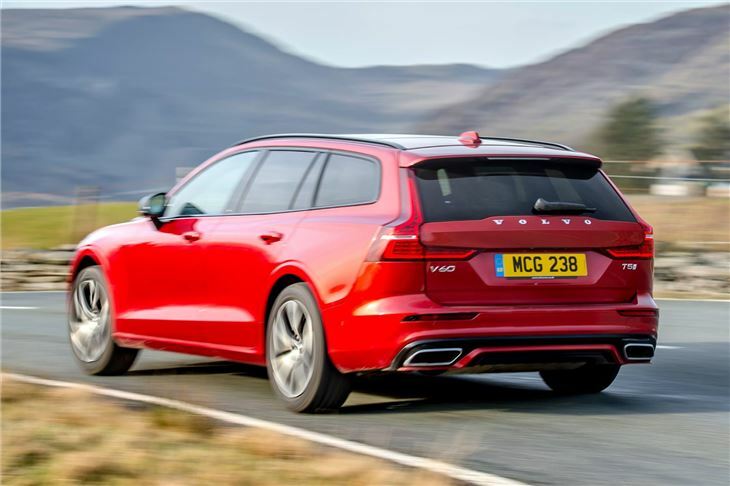 On smaller wheels with its standard suspension, the V60 isn't as dynamic as an Audi or BMW but it's more absorbent and ideal for stress-free travel. For the ultimate in all-terrain comfort, the V60 Cross Country provides a very compliant ride as well as off-road capability.